You always have to start with garlic knuckles. 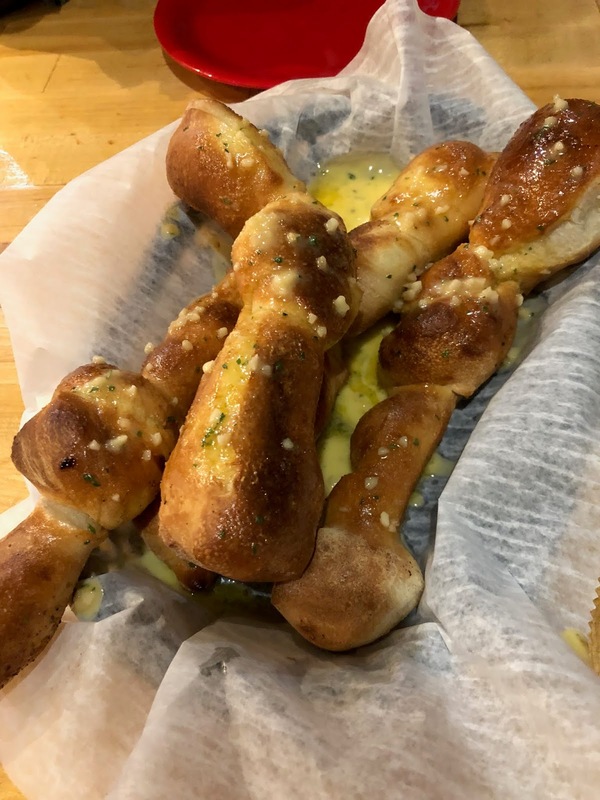 These are just twists of dough, but they come sitting in a pool of garlic butter. 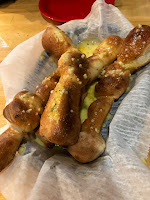 I was sad when I heard our server ask the table next to us, “Can I start you with an order of garlic knuckles?” And they said no. I had to restrain myself from going over there and telling them they were making a huge mistake. But I didn’t go. My daughter would have been horrified. But the knuckles are really good, and the extra sauce is imperative for dipping your crusts later. This was the first time I had been for dinner. At lunch you can just order a slice of pizza, but at night it’s whole pies only. So we “suffered” through it and ordered one for the two of us. 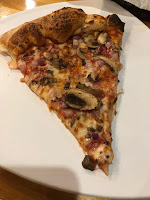 I got my classic pizza topping, mushroom and red onion, and my daughter got pepperoni. Even though we got the “smaller” 16-inch version, it was way too much food for us and made for a hearty second dinner the following night. This is hands down my favorite pizza place in Indy. 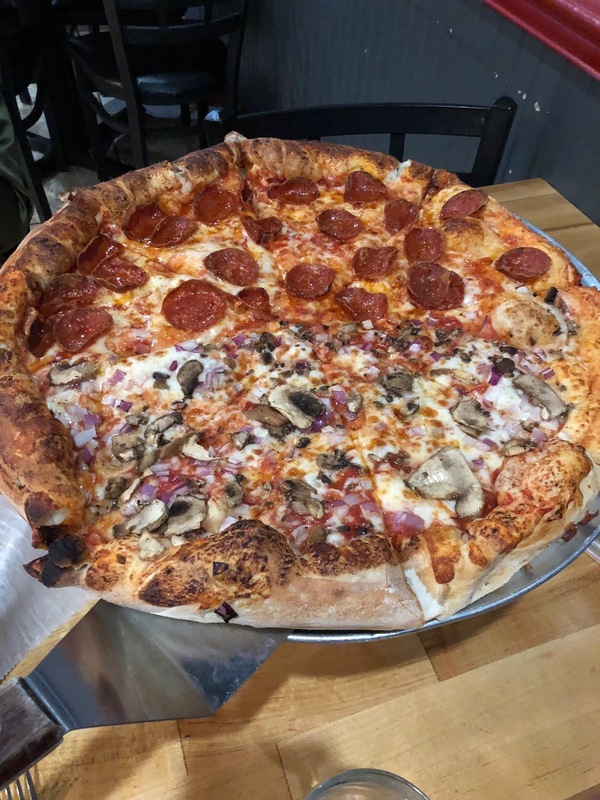 It is one of the few New York style pizzerias in Indy, and it pulls off that authentic chewy, foldable crust. 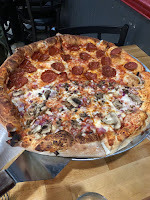 And one of the benefits of ordering a whole pie is that they make it to order so I got a lot more uniform mushroom and red onion distribution. On a slice, for my combo, they just take a cheese slice, add my ingredients and then add a little more cheese. Still good, but not as proportional. Bonus points to the waitress who carded me when I ordered a glass of wine. We all knew she wasn’t fooling anyone, but it increased her tip anyway. Seriously, if you haven’t been, check it out. Totally worth it. I'm taking a week off to celebrate the holidays with my family! 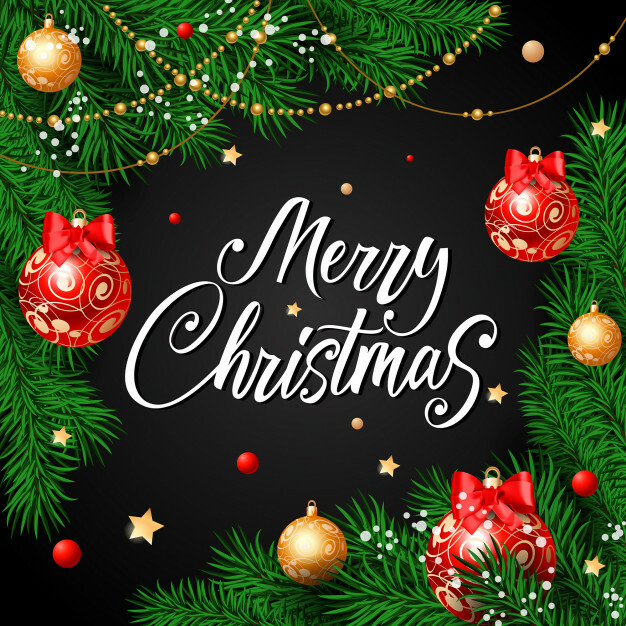 I hope you are all eating and drinking well! Please share what you will be making/eating for the holidays! See you next week with a new post! Cheers! Turf Catering Kitchen- Dinner at Turf! Pretty sure I have told you this before, but Turf is one of the best things going for a dinner party with friends. You can have up to 10 people (it’s a squeeze, but we managed) and the chefs will develop a menu for you. You can BYOB and the whole menu is $85 per person. They don’t skimp either. And the food…well it was amazing. 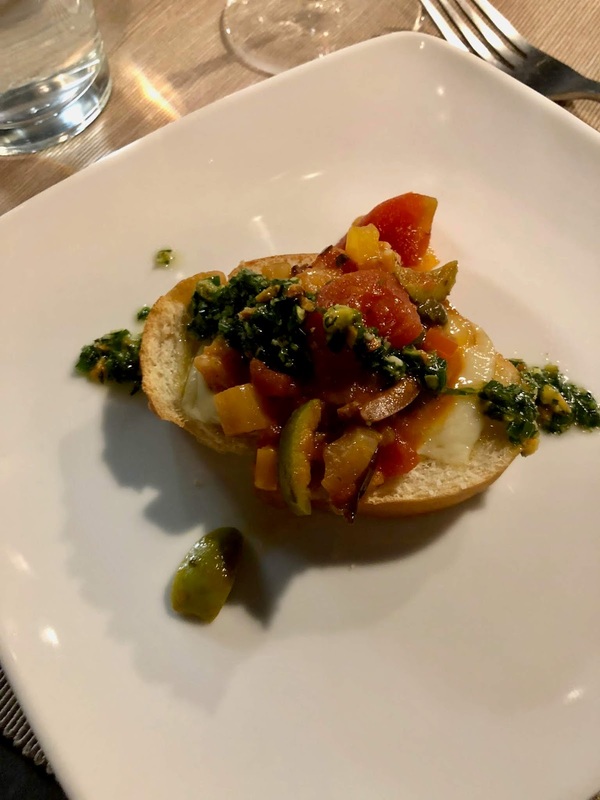 First, we had a crostini with Petite Basque cheese, topped with cooked tomatoes and olives and drizzled with pistachio and herb pesto. This was one of my favorites—I mean add olives to stuff and you know I am going to like it. But I really appreciated the combo of saltiness, acid and rich creamy cheese. And I got to eat pistachios, which is something I avoid at home because my son is allergic. The next course was family style poutine. 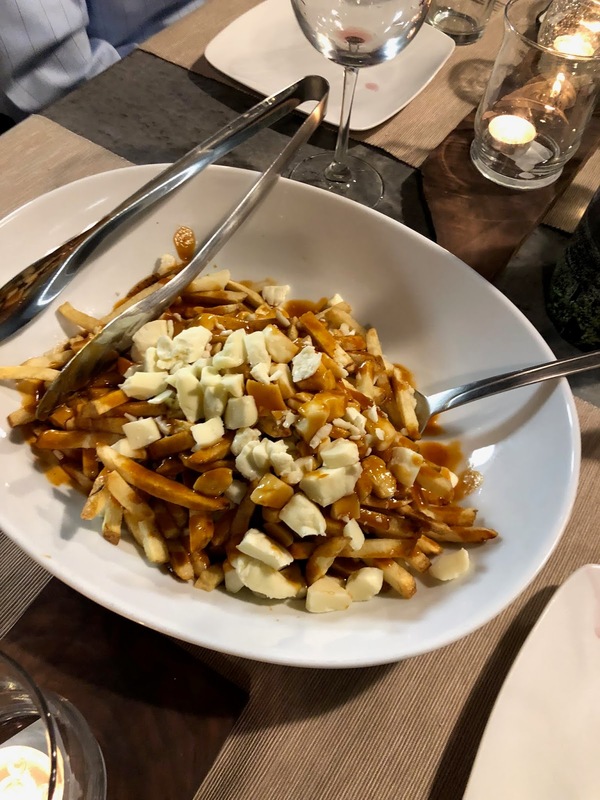 It’s funny, poutine is our comfort food at home---the thing my kids will make when they’re on their own. It’s simple, and this was a good one. 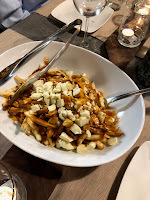 Crispy, thin fries tossed in a salty, beefy gravy and topped with lots of fresh cheese curds. It was kind of addictive and while it seemed like a ton of food (they brought out two big bowls for the 10 of us), we managed to eat it all. My only complaint here is that I wish the fries and/or the gravy were a little bit hotter. 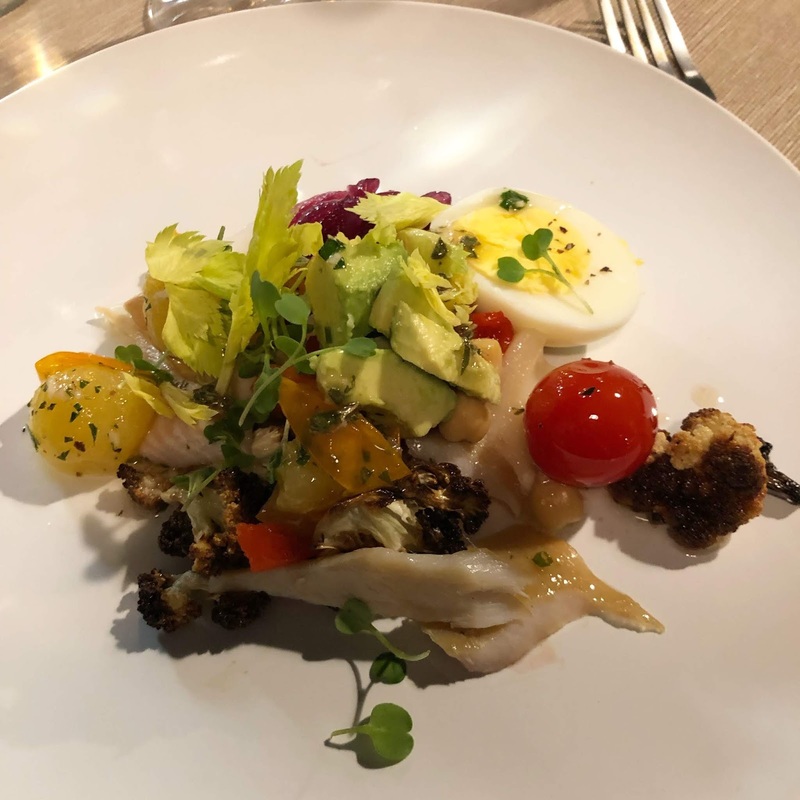 Next, they brought us a beautiful bright salad with all kind of things in it-there were chickpeas, hearts of palm, greens, tomatoes, avocado, pickled red onions, roasted cauliflower, and boiled egg. And the real treat of the salad were the bites of smoked trout scattered throughout. The whole thing was topped with an herb vinaigrette. This was pretty much like my perfect salad. All my favorite things. 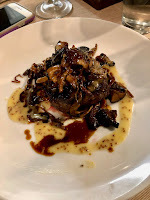 The main entrée was a wagyu filet of beef that was topped with this insanely rich oyster mushroom ragout. There was a mustard buerre blanc underneath it. This was a very popular dish at the table. It was perfectly cooked (medium rare) and the mushrooms added a nice nutty flavor. There was a hint of truffle oil as well. I will admit, I was getting pretty full though and took some of mine home. Delicious though. 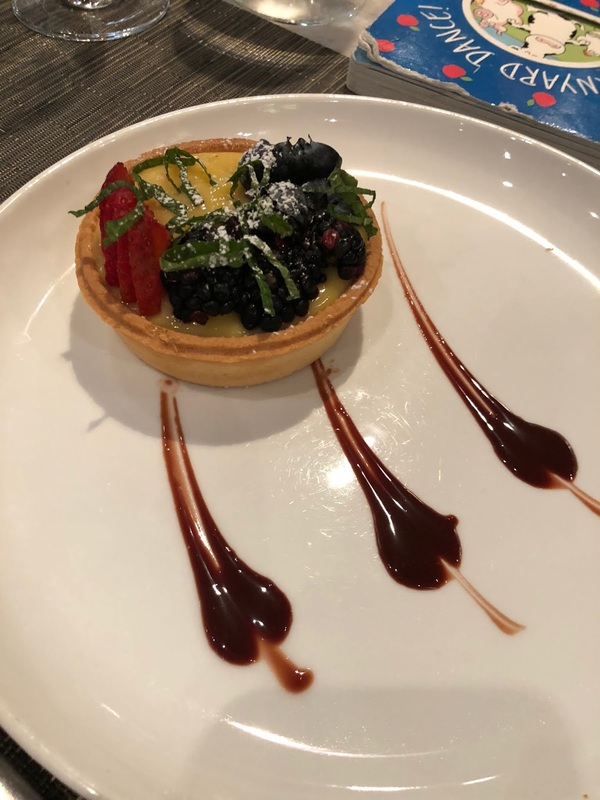 But just when I thought there was no way I could eat another bite, they brought out dessert. This sounded kind of simple, and I guess it sort of was, but it was so, so good. It was hot chocolate cake with marshmallow cream and caramel and ice cream. Seriously, I don’t’ know what made this cake taste so good, but I asked them for an extra piece to take home to my kids because I knew how much they would love it. I think that marshmallow throughout really made it have that hot chocolate flavor. So, so good. All in all, this is such a good deal and a fun way to have a dinner party with friends where you don’t have to clean up. You have the place to yourself and can drink what you want. They’ll even let you pick the music if you want. And the people there are all so nice. It’s an intimate setting and you can talk to the chefs and ask questions if you want. They will also make accommodations for dietary restrictions if you let them know. I highly recommend it! And for what you get, it’s a great deal. P.S. They have some of the best sandwiches for lunch too. Just check the schedule on social media first, because they aren’t always open if they are catering. Anyhow, there was a bunch of us, and I got to try a bunch of things. One of my favorite things were the poke tacos ($16). I am sure this comes as no surprise to those of you who regularly read my blog. But these things were so good and seasoned just right. There was lots of fresh avocado, daikon sprouts, a slightly spicy salsa and sea salt. So, so good. We ended up ordering about 4 orders for the table (there are three per order) because they were so popular. We also ordered some Cajun shrimp toast, which was interesting. 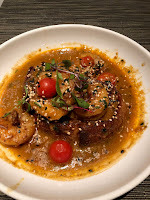 The sauce was a spicy creole type sauce, but it also had a slightly Asian flair with sesame on it. The shrimp were pretty spectacular because they were cooked so perfectly. The bread had onion and bacon in it. 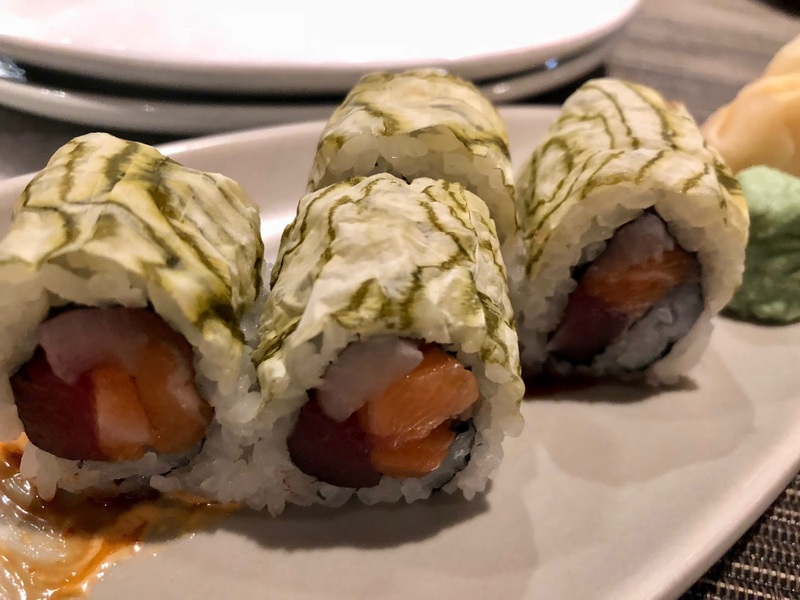 We had a sushi roll to share as well, and it was really, really good as well. 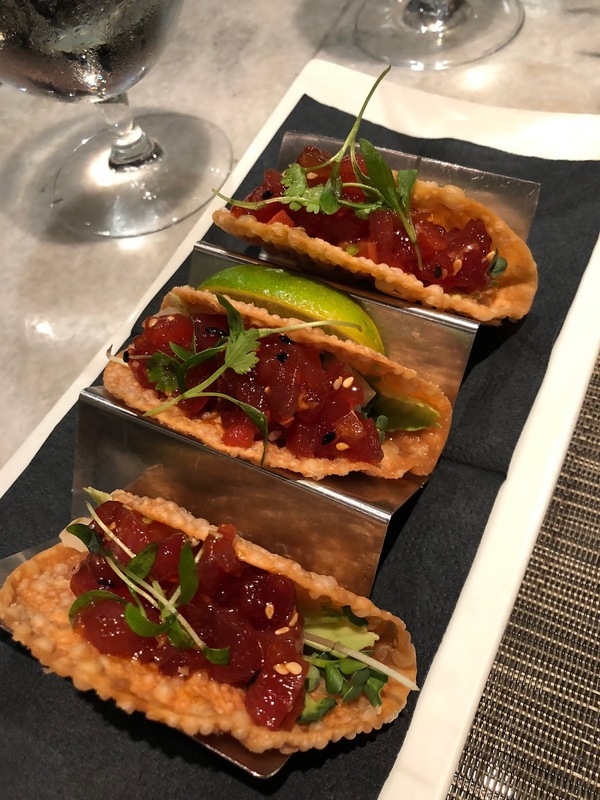 It was the kamikaze roll ($16), which had tuna, salmon, and nigiri inside, and was served on top of a spicy mayo and wrapped in this interesting white soy paper. Simple, but just enough of a spicy sauce to make it shine. 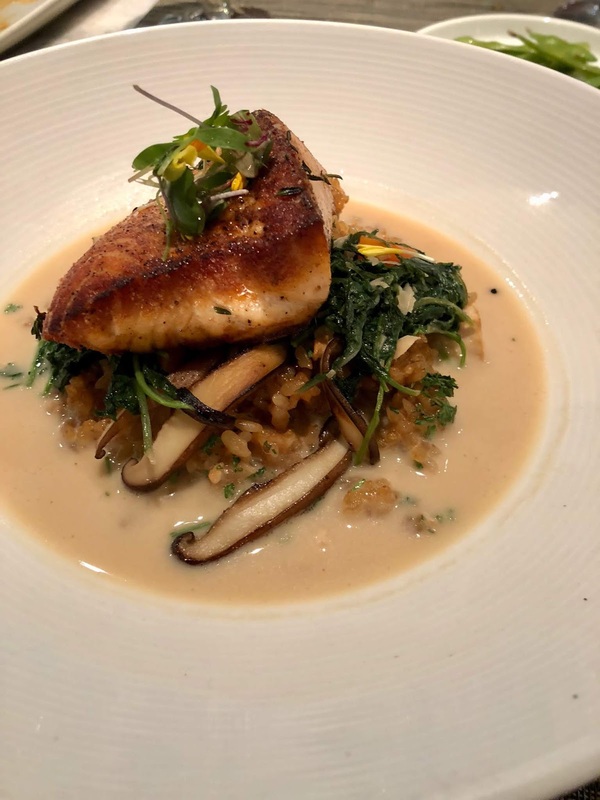 I ordered the salmon hot pot ($24) for my main dish which had this really tasty and sticky unagi fried rice that was topped with some tofu, shitake mushrooms, some greens, and a miso broth. Oh yeah, and that beautiful hunk of seared salmon. Delicious. The flavors were deep and so good. 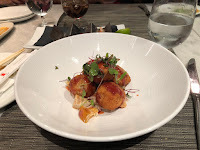 My daughter had the duck confit croquettes ($14). These were little balls of grits and peas with duck confit and topped with citrus, fennel slaw and yuzu vinaigrette. She liked them ok but didn’t think they were as good as everything else. She would pass on this next time. 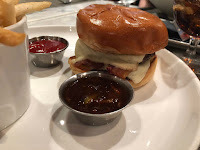 My son had the specialty burger, the “Seoul Burger ($18),” which had bacon, kimchi, white American cheese and a special sauce. He had the sauce on the side. It came with fries and it was also delicious. Juicy burger, Brioche bun and nice crispy fries. But with an Asian flair. Totally worth getting. We even had this wonderful yuzu tart for dessert, which hit the spot after a lot of rich and salty food. And having a nice dinner after a leg of traveling is a welcome break. Seriously, if you find yourself in Atlanta at the airport with some time to kill, check it out. 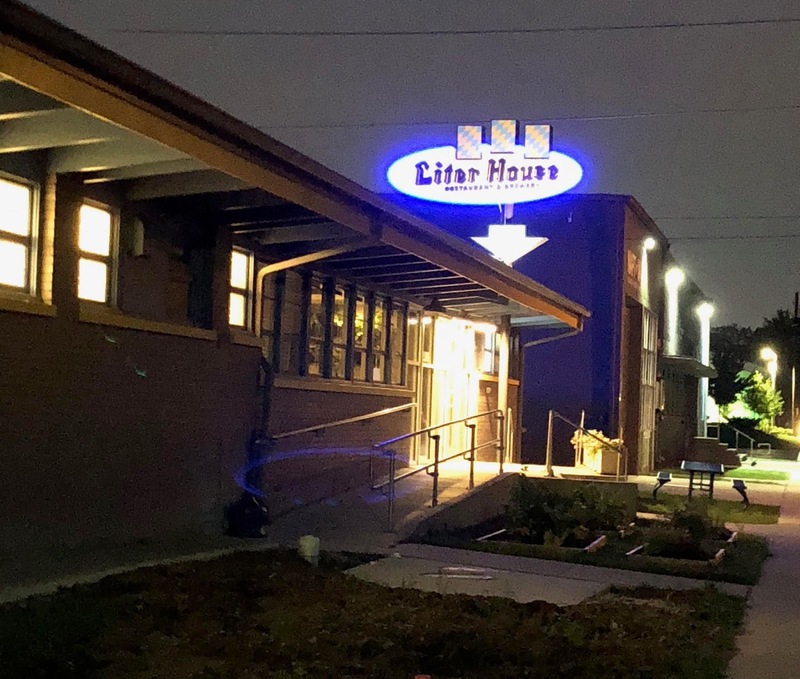 Hubby and I went to Liter House the other night. We had been before, but there’s been some chef shake ups, so I wanted to wait to write about it until the new chef had been in charge for bit. The current chef is Adam Ditter, formerly of Longbranch and the Vanguard. 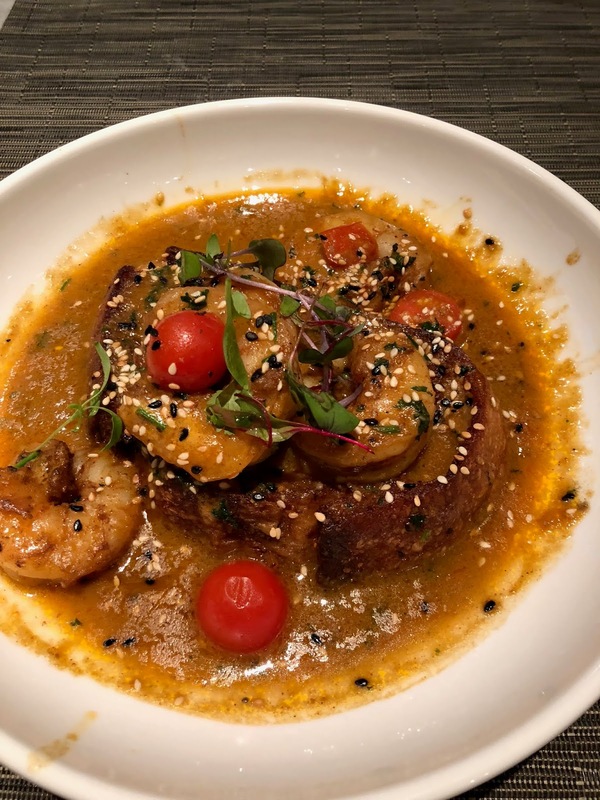 You can see some of his Longbranch/Asian influences on some of the specials, such as the one I ordered, but overall the menu maintains its German theme. We started with the potato latkes topped with raclette cheese and sauerkraut ($10). This was a generous serving and so, so good. 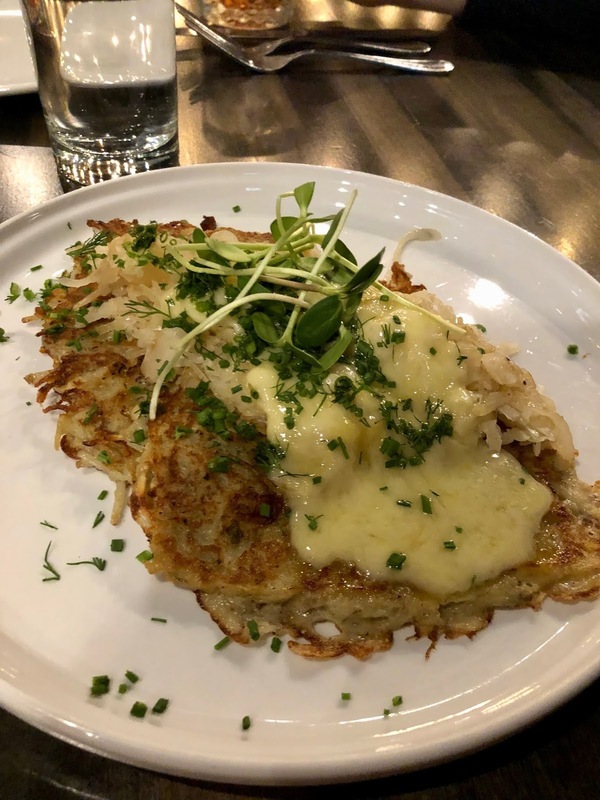 There were a couple of large crispy potato pancakes topped with the melted creamy cheese and then some caramelized sauerkraut and onions. This was such a good combo with the crispy edges of the potatoes, the creamy richness of the cheese and the acid from the sauerkraut. I would totally get this again. They also do a version with mortadella instead of the cheese, but I don’t know how you would pass up the cheese. Hubby ordered the pork schnitzel ($18). 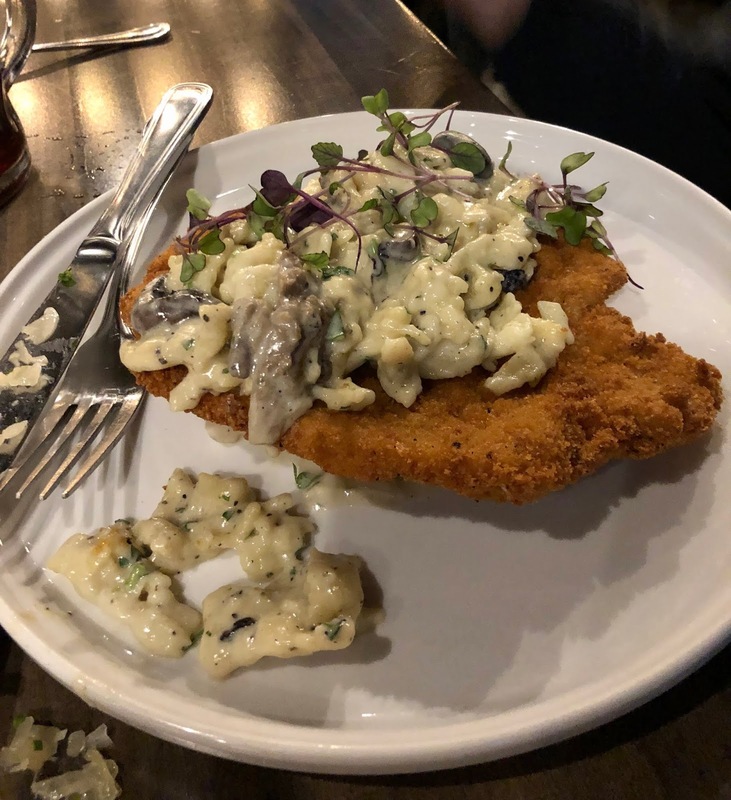 This was an intensely tender piece of fried pork tenderloin topped with a creamy mushroom sauce and homemade spaetzle. Wow, this was such a great dish. The spaetzle was tender and held up really well to that mushroom sauce. It was a great combo. Everything was cooked just right, and I was impressed. Luckily hubby was up for sharing, because I ate a fair amount of his. I ordered one of the specials of the night, which was the mapo tofu ($14) Let’s face it. 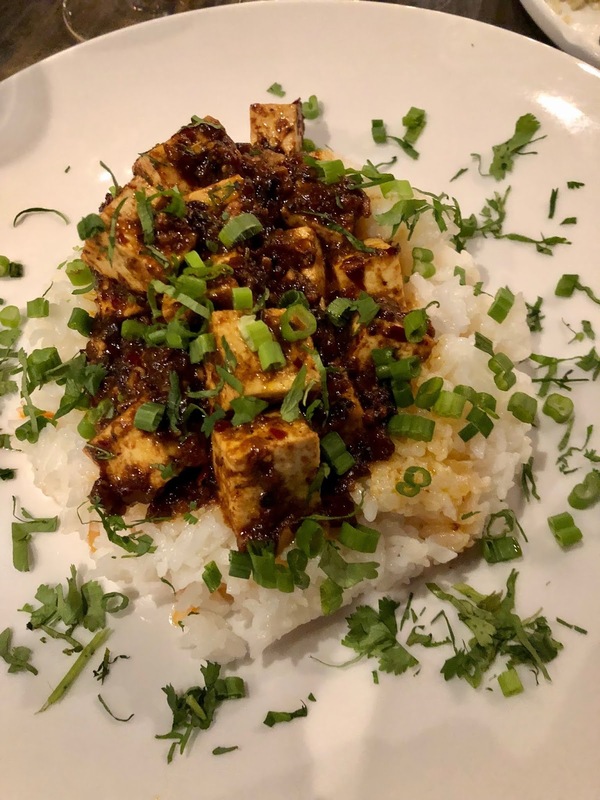 I will order mapo tofu just about any time I see it on a menu. German restaurant? No exception. So it’s hunks of tofu on rice with a sauce that had black beans, garlic and a hot Chinese sauce that was so hot, it was almost too much for me. I have had the chef’s version of this dish at his other restaurants, but I feel like this was the hottest one yet! Definitely a lasting residue of spiciness with this one. I love this dish and general, and this one was well done, but it was to the point heat-wise that I would likely not order it again here because it detracted from the taste of everything else (luckily that creamy sauce on the schnitzel helped). If you really like super spicy though, I would go for it. Also, they might want to warn people about the heat level. We had some time to kill before we picked up our daughter, so decided to have a dessert as well. 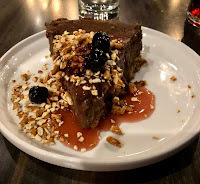 We had the chocolate cheesecake with pretzel crust and blueberry beer compote ($8). Wow, another great combination of flavors with the sweet cheesecake, the salty pretzel crumbs, and the tart compote. 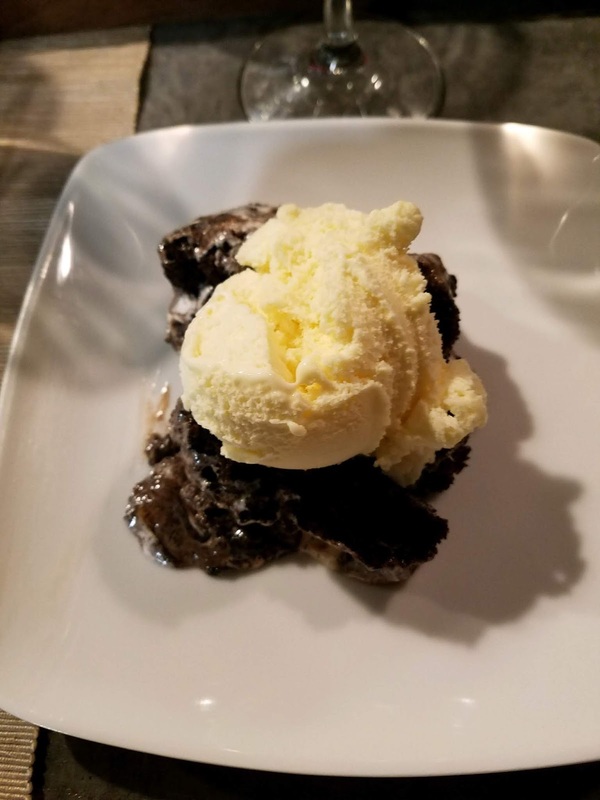 Get a little but in every bite and it was perfect. I appreciated how all the food overall was so well balanced. Hubby was also happy to see more German style beers and appreciated the price points as well. He had the Dunkel for $6 and was pleased. 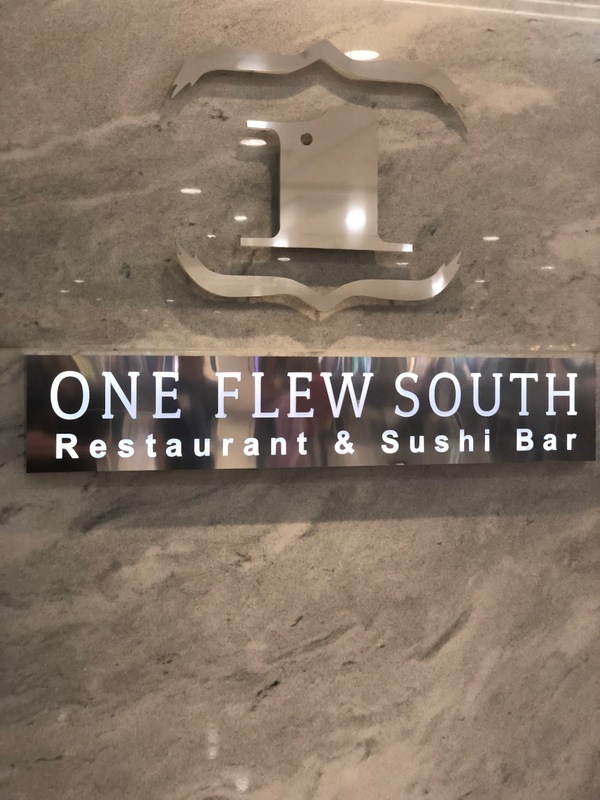 Our service was very good, and the crowd was pleasant. It was busy but not ridiculously loud. I also really appreciated the fact that it was the proper (warm) temperature in there for a winter night. I hate freezing in restaurants and I always seem to whether it is summer or winter. My only complaint about the atmosphere is that we were seated at a high-top table in the bar and the either the stools are too short for the table or the table is too tall for the stools. I felt like I needed a booster seat. As it was, I sat on my foot all night to prop me up a bit. 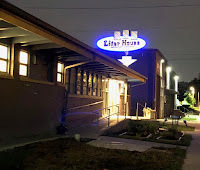 I have also heard that they are working on opening a Texas-style smokehouse in the back and I look forward to trying that when it opens as well. 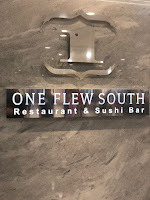 Overall though, I was very impressed and look forward to trying more things on the menu. What have been your favorite things?